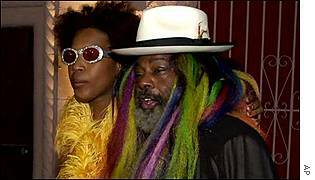 Musician George Clinton is suing celebrity lawyer Johnnie Cochran Jr's legal firm, after he lost the rights to his own music. The singer is claiming fraud and malpractice over a copyright dispute. The 61-year-old singer hired Cochran's firm in 1997 to represent him in a legal battle with the publishing company Bridgeport Music Inc.
Cochran is famous for his defending of OJ Simpson in his murder trial and Sean "P Diddy" Combs and his gun possession and bribery charges. Both men were cleared. In Clinton's copyright trial Bridgeport claimed ownership of his back catalogue of music. Clinton alleges that one of Cochran's employees, Donald Wilson Jr, failed to defend his interests competently. He claims Wilson did not effectively cross-examine witnesses and lied about the potential for witnesses to support his case. As a result Clinton claims he lost all rights to the copyright of his own music. The 60-year-old singer is best known for his work with the bands Funkadelic and Parliament. Clinton was born in Kannapolis, North Carolina on July 22, 1941. He formed the Parliaments in 1955 but they had to wait until 1967 before they clocked up their first US hit, (I Wanna) Testify which made the top five in the R&B charts. Recording both as Parliament and Funkadelic, the group's combination of soul and funk music earned them 40 R&B hit singles in the US during the 1970s. In the 1980s Clinton had to battle a series of court challenges over royalty issues, although he did release a number of solo albums. He continues to tour the US with his P-Funk All Stars.